A bus of immigration amnesty activists is rolling through Mississippi today on its way to a protest along the southern U-S border. They are calling for a radical shift in U-S immigration policy. 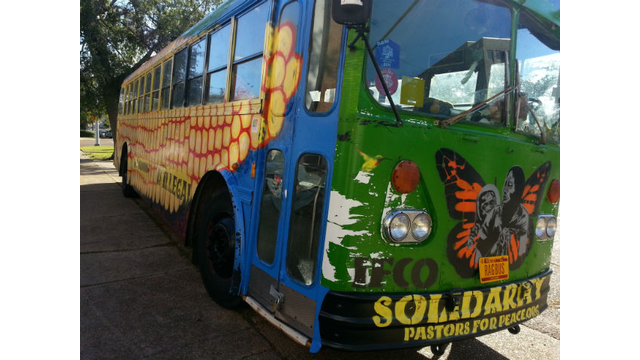 Riding a garish yellow and red bus with 'solidarity and 'no humans are illegal' written on it, the immigration amnesty advocates are passing through Mississippi today on their way to a protest along the border. Ana Marie Cardanas, who was brought to the US from Columbia as a child but is now a citizen, organized the bus trip to call for legal status for all immigrants in the US and an end to efforts to construct a fence along the southern U-S border. "How much money has been spent on this and it hasn't been effective. So why don't we use this money for our own communities. For education and health care. Change this policy to a more humane policy to where we welcome people. Because these people are not coming here to take jobs. The jobs they do take are the jobs nobody in the US will do," Cardanas said. Cardanas and others blame much of the immigration rush to the states on violent conditions in central and south America. Pablo Blanco, also a U-S citizen, is a member of small minority of black Hondurans known as The Garifuna who are fleeing their country after systemic abuse of their land and human rights. "I could have been one of those children coming on The Beastia, which is the train that comes here. And that's pretty much why I am here. I have to speak on their behalf because they don't have a voice because they are undocumented," Blanco said. But leaders of Mississippi are heading in the exact opposite direction, pushing against amnesty and greater immigration. At the height a recent controversy during which state out against migrant children being placed in Mississippi, Governor Phil Bryant called on the federal government to stop a program that placed some of those children in the state. "Our concern is will that be a gateway to more children been sent. Only 13 states have such a program. And are concerned that that opens the gate for even more of the illegal children that are coming across the border," Bryant said. State lawmakers have also previously tried, and failed, to pass state based illegal immigration laws intended to crack down on residents living in Mississippi illegally.